Drought readiness - you can't always count on the rain! It's no secret it's been a hot, dry summer. While drought is not inevitable, with the combined level of our drinking water dams hovering at 70%, it is time to start preparing ourselves - and our homes, gardens and pools - for the possibility of a drought. Reconsider when and how much to water your lawn and gardens. Aim to avoid the heat of the day. Can some plants handle a little less watering? Check if your shower heads, taps, toilets and other appliances are water efficient. Choose water efficient products with a high-water efficiency rating. Do full loads in the washing machine and dishwasher. Check and fix leaks around the home. 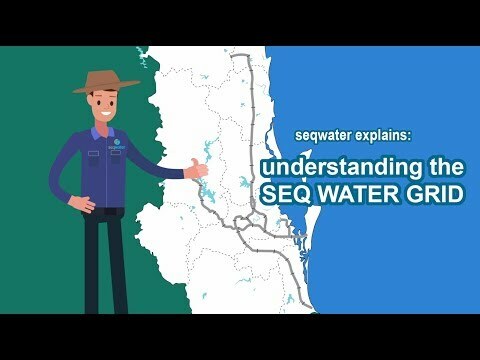 For more details check out seqwater.com.au/waterwise or the waterwise videos on this site. It may seem strange that we are talking about preparing for drought when our drinking water dams levels are at 70% and some dams are even spilling! But the nature of South East Queensland's climate is some areas can receive lots of rain while others get none. We have a system to transfer treated water around the region so we can help each other out during dry times. So over the past week we've had some downpours and some places in South East Queensland have already received their average monthly rainfall for the entire month! So why didn't our dam levels rise very much? (They went up 0.8%. At current consumption this is about two weeks' of water supply). Check out our below, but in short, when the ground dries out during hot and dry weather, it takes more rain to generate run-off into our dams. South East Queensland’s water use is at a record high following a hot and dry summer. January’s average water use was the highest since the Millennium Drought broke more than a decade ago. Water use peaked at an average of 239 litres per person per day, an increase of almost 70 litres a day extra than the average 170 litres per person per day since the Millennium Drought broke. Check for leaks - many leaks are underground so you may need to use your water meter to check for leaks at home and in your irrigation system. A good mulch will help your plants retain water and reduce weeds that also compete for water. Why can’t we pump all this water south? North and North West Queensland have been hit hard recently by floods. Townsville received their usual yearly average rainfall in a week. When it’s so dry here in South East Queensland, a lot of people think there must be a way we can transport water from areas where there is too much to areas where there is too little. Generally water is sourced and treated locally, as this is the most economical option, but South East Queensland can pump water to drier areas if needed. We call this the SEQ Water Grid. We can move treated water around the region using more than 600kms of pipelines. The grid is designed to move water from one part of the region to storage reservoirs in another to take pressure off local supplies during dry periods or transfer drinking water from one area to another when a local treatment plant is offline for maintenance. While we cannot supply all of the region’s water supply without local rainfall, the water grid can help move some water to drier parts of the region. Pumping water from north to south Queensland would be similar to the grid but on a much bigger scale. At the moment, with the technology available to us, the costs of pumping and storing the water such long distances make such schemes uneconomic, compared to desalination and recycled water. We will continue to monitor and investigate new transport and storage methods but for the moment, our plan for South East Queensland’s water future is to encourage everyone to be water efficient, wisely use the SEQ Water Grid and plan well for future infrastructure. It’s been fairly dry over summer, and our lawns and plants are starting to feel the pinch. You can count on it to rain when you don’t want it to: there’s wedding day rain, long weekend rain and school holiday rain! What you can't count on is rain when we need it, where we need it. We'll be talking to communities in the Scenic Rim, Gold Coast and Logan from now until Easter about what they want their water future to look like.